I have been having fun exploring the "new" Gypsy. The features that have been added are some that I have been waiting for ever since the launch last year. I designed these stars and a card with a star cutout using the Gypsy and the two exclusive Gypsy cartridges. I started with this kite shape on the Gypsy Wanderings cartridge. With a little bit of calculation (yes - math is helpful sometimes!) 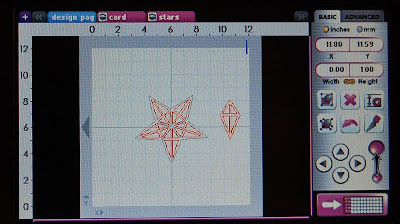 I determined that I could create a five pointed star by rotating the shape in 72 degree increments (360 degrees divided by 5 points equals 72). Then I aligned the shapes, using the outer edges as a guideline. 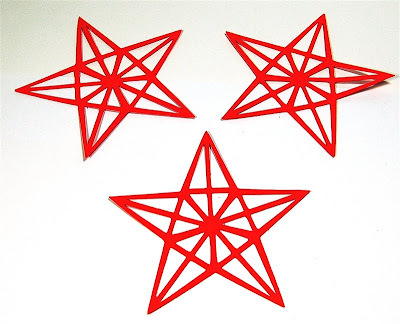 For the star shapes, I welded the five kites together. 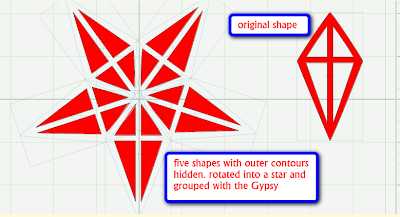 With the Gypsy, I was able to group the five shapes (even though they were at different degrees of rotation) and then quickly copy and paste ("duplicate" in Gypsy lingo) the entire group. This ability to group images that have been individually altered is one of the "missing" capabilities in Design Studio. Here are the test cut stars - I was thinking of the Fourth of July when I made these but the stars could also be used for Christmas. I used the "hide contour" function to create this card with the star cutout. 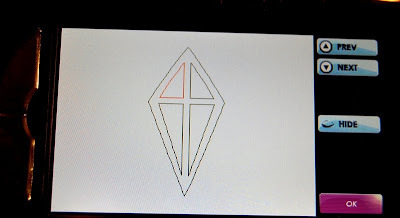 In order to make this sort of design you just have to look at shapes and imagine the cuts that would result if the outline line of the design was not cut. This is one of my favorite types of card. This screen shot is from Design Studio - the light blue lines are the hidden lines. On the Gypsy, the hidden lines will be gray. 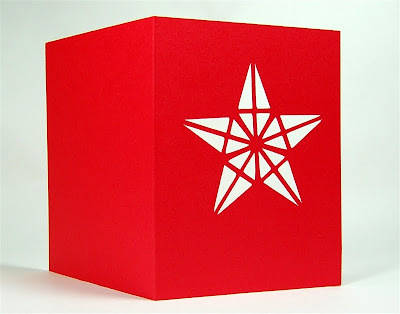 I originally chose this shape to use for the base of the card. 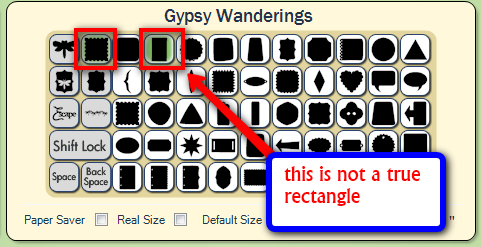 It appears to be a rectangle but I noticed it looked a bit odd on the Gypsy screen. 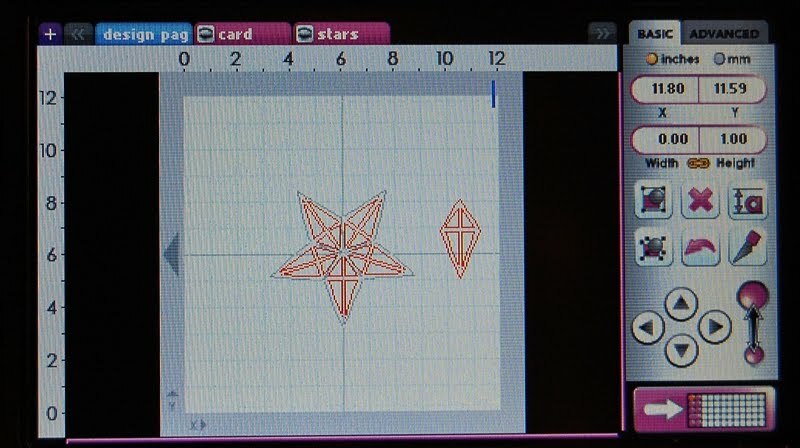 After I cut out the card and put it on my Scor-Pal to score I found out that the shape is definitely a bit off kilter. 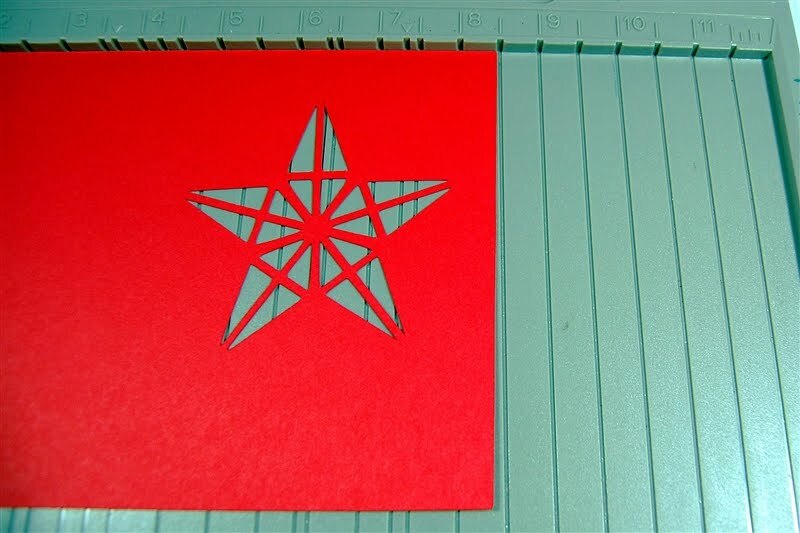 So I went back to look for a true square or rectangle that I could use to cut the card shape. 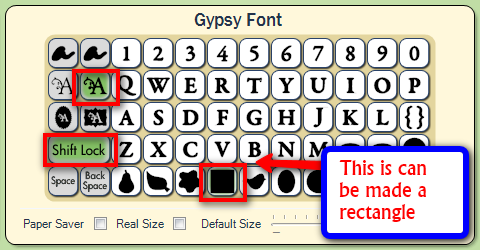 I found this square on the Gypsy Font cartridge (I was trying to create something that could be cut by anyone with a Gypsy and the two Gypsy cartridges are preloaded on every Gypsy). 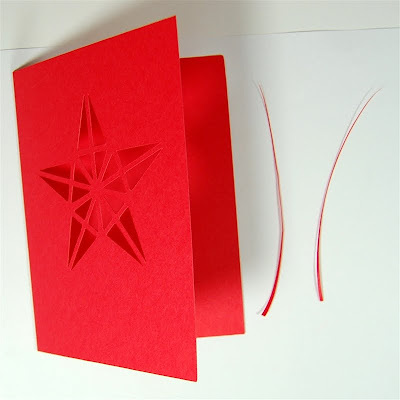 I was able to trim the first card I cut to even up the sides making it just a bit smaller than standard A2 size. When I substituted the square from the Gypsy Font cartridge and cut the card again the size and shape were correct. To hide a cutting line with the Gypsy, select an image and then tap on the icon that looks like two corners at the lower right of the group of buttons. The button can be selected if there is a purple line showing. 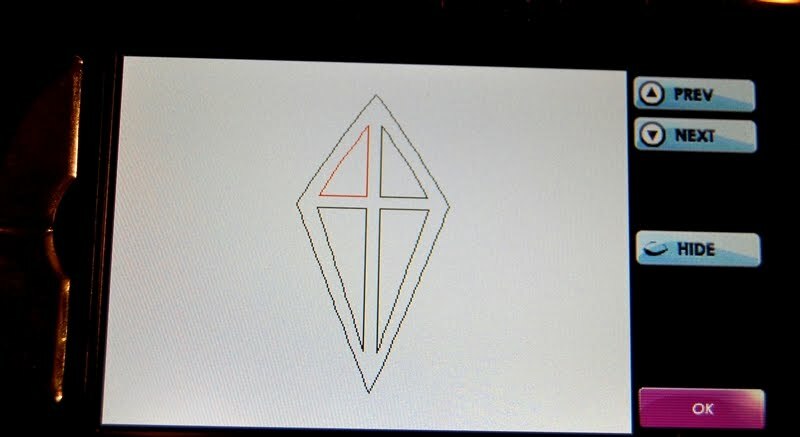 This screen will appear - the image is shown with one of the lines or contours in red. If you want to hide that line, tap "hide" on the right. If you change your mind the button will say "show" when a hidden line is selected and you can tap it to bring the line back. 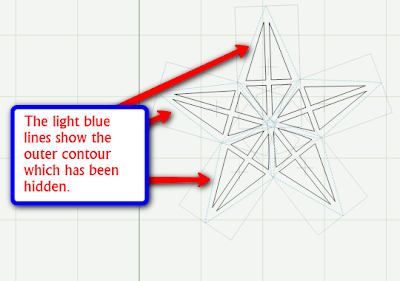 You can use the "prev" and "next" keys to scroll through the lines or click on the top left silver button to select each line in turn and then hide the ones you do not wish to cut. Another great improvement in this Gypsy update is the ability to name the tabs for the layers and to "turn off " the layer so the images will not show while you are working on another layer. To do this you simply click the little eyeball on the tab to open or shut it. You can drag the tabs back and forth to rearrange the layers (the tab that is being dragged will turn green). The blue tab is the active tab and the pink tabs are the inactive tabs. 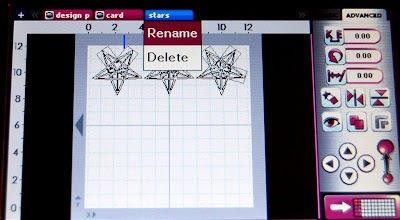 To label the tab, put your stylus on the tab without moving it and two choices will pop up - rename or delete. Rename will take you to the keyboard screen to type the tab name. I have transferred the file back and forth between the computer and the Gypsy using the Gypsy Sync. 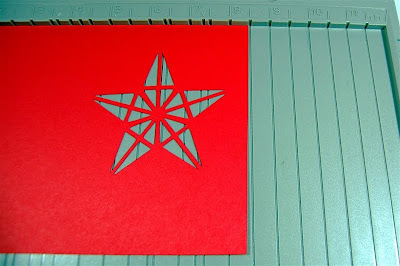 I believe that the file is correct but one time I needed to redo the grouping and weld for the star cutouts. I am happy to share the file but I would like to ask for someone to test it before I put the file up for general downloading just to be sure that everything is working correctly after the transfers. You can just leave a comment or send me an email or message on Facebook. I would be happy to trial cut the design for you if you want to send it to my email. Looks great and a terrific idea and design. 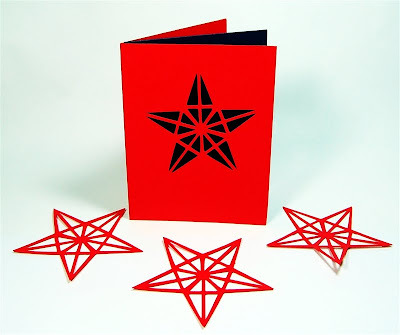 should make some neat stars for christmas. Can't wait to try out the new updates. Have not done them to be sure the hitches are out. Busy weekend will do next week. Thanyou so much for all your hard work figuring things for us who get frustrated with some of the new changes when we don't do change well. Diane, Your blog is one of my first "go to" blogs everyday. Your creations are always wonderful and so informative. Thank you. However, for the last couple of days, before your blog has completely opened, a dialog box appears saying "message from website, stack overflow at line:0" Do you know what this means? Then the only option is to click ok. I didn't know if others were experiencing this as well. I have a brand new, only days old laptop, however, I was also getting this message on my old desktop, too. I love how "on it" you are with the updates! Of course, I did my update and immediately played to discover what all was new - love the "hide contour"! I hosted a crop yesterday and all of my girls count on me to be their "guru" with the Gypsy. LOL! I'm thrilled with all the new changes and I would love to try your card if you want to send it to me, I will take care of it today. 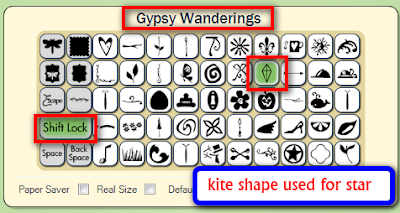 Another great tutorial, and just in time for me as Tuesday will find me finally in possession of my very own Gypsy! I'd be glad to test it for you. Great design! And thanks for all of the help! Beautiful! I don't have a Gypsy, but I think I might try something like this with SCAL2 and see what I can come up with. What I love is that once you get it right, you can save it and resize it for whatever project you want. Thanks for the inspiration! I guess everyone is having a picnic. If you have not chosen someone by now I would love to be your tester. I really appreciate all the testing you have done for us. I love your Star card! What vision you have to see these shapes as you do! I've never downloaded a file and tried to transfer and cut it on my Gyspy...but I'll give it a try if you want to send it to me as a test! It will be a TRUE test... considering I have no idea what I'll be doing! LOL! Thanks to all of you who offered to test the cut - I actually was able to do it myself and have posted the file in the post on May 31st. 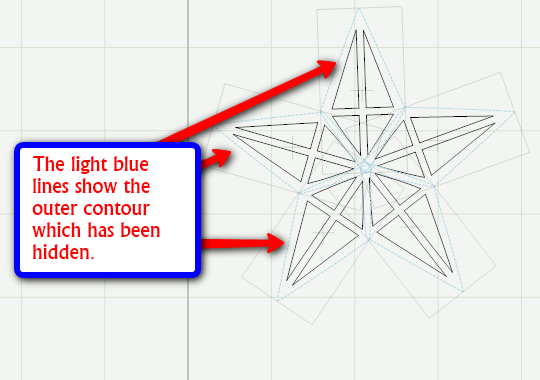 If you have copied and pasted an image in Design Studio, the ability to use "hide selected contour" will be grayed out. 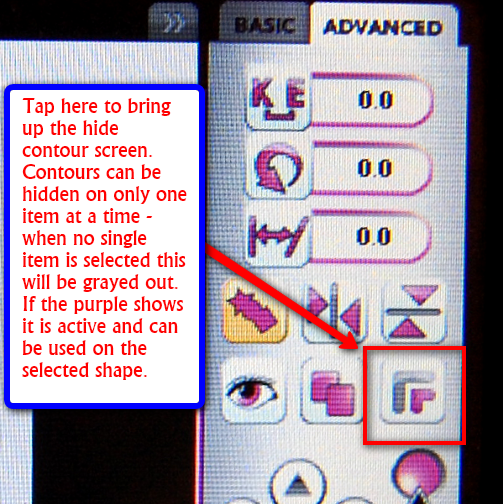 You just need to save your file and reopen it to make the "hide selected contour" active again. An odd quirk but easy to work around once you know how to do it. Thanks for the lovely compliment on my blog. I have not seen that message or heard from anyone else that they have this problem. Is it still happening or was it just a temporary problem? Did you change internet providers or use a different browser? Take care - I hope you had a great Memorial Day weekend! what a gorgeous star! wish I had the gypsy so I could make this. Just love it! What a great teacher you are. Your specific directions and pictures are so helpful for a newbie like me. I am sooo glad you like the Gypsy update and will be using your Gypsy more. Lucky Ducky us!! I am a newbie and have a Mac so have sometimes found it difficult to find such specific directions that teach me. As you know I couldn't use DS with a Mac--it was a Gypsy or nothing. Thank you so much-the star is lovely and the lesson was the best!! I am sorry but the file uses the Gypsy exclusive cartridges and so I can't make it a file that will cut with CDS. 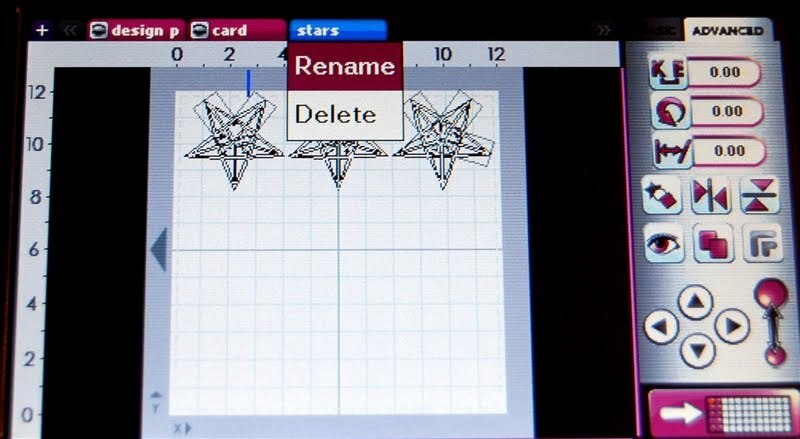 When I get a chance I will look around to see if I can find a similar kite shape to use from another cartridge. 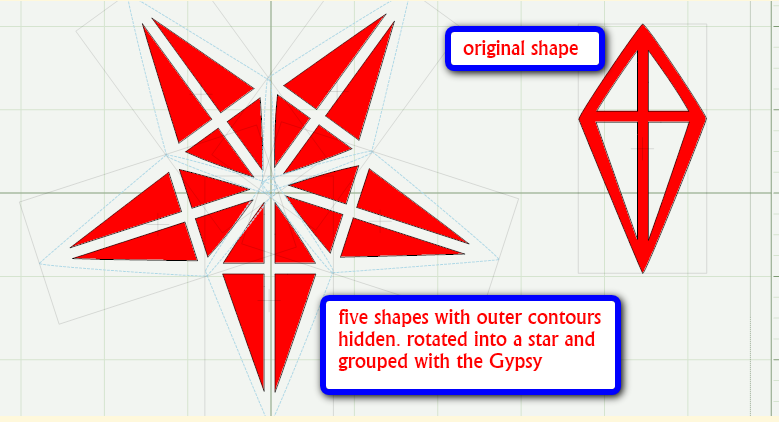 In the meanwhile, you could download the .gypsy file, bring it into Design Studio and try to find a substitute shape or shapes on your own (I know it will be a few days until I can get to this).